In the 28th century, Valerian (Dane DeHaan) and Laureline (Cara Delevingne) are a team of special operatives charged with maintaining order throughout the human territories. Under assignment from the Minister of Defense, the two embark on a mission to the astonishing city of Alpha - an ever-expanding metropolis where species from all over the universe have converged over centuries to share knowledge, intelligence and cultures with each other. 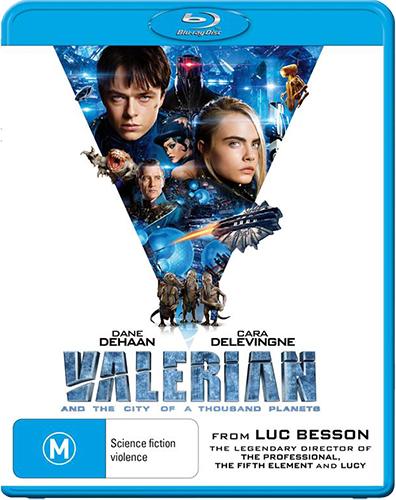 The 'Valerian And The City Of A Thousand Planets' competition has now closed. Winners will be announced shortly. Competition opens at 5pm AEDT on Sunday 19th November 2017 and closes at 11:59pm AEST on Sunday 26th November 2017. Five winners will be chosen at random on Monday 27th November 2017. To successfully win, entrants must fulfil the above entry conditions before the time the competition closes. Current members/followers are eligible to enter the competition. Only one entry per person. Only one winner per household. To be a valid winner, the entrant must not have won a prize from SWITCH within the last 28 days. Each winner will receive one Blu-ray copy of 'Valerian And The City Of A Thousand Planets'. By entering, you agree to receive occasional emails from SWITCH in the future. If you decide to unsubscribe from these updates, any further entries will not be applicable. Only Australian residents are eligible to enter. 'Valerian And The City Of A Thousand Planets' is available on Blu-ray, Digital and DVD on Wednesday the 22nd November 2017 from eOne.